In and Out of Consciousness: Greatest Hits 1990–2010 is the second greatest hits compilation album by the British singer-songwriter Robbie Williams, after his first greatest hits compilation, Greatest Hits, which was released in 2004. The album, which features 39 songs, was released in October 2010 and is his last album under his recording contract with EMI. The lead single of the album is "Shame", co-written by and featuring fellow Take That member Gary Barlow. The song is their first collaboration in 15 years since Williams left Take That in 1995. The album debuted at number one on the UK Albums Chart, making it Williams' ninth album to debut at number one and his first since Rudebox released in 2006. It has been certified Platinum, selling over 41,000 copies on its first day of release and 120,000 copies during its first week, making the album the second-fastest selling of the year in the UK. The album topped the charts in Austria and Germany, and charted within the top five of the charts in Ireland, Italy, the Netherlands, Portugal, Spain and Switzerland. Speaking about the album and working with Barlow again, Williams said: "It’s incredible to listen to the album and realise that it’s already been 20 years of making music and playing gigs. And the great thing about the album is that it’s not only a celebration of my past but also a bridge to the future. The fact that part of the future includes a name from my past makes it all the more poignant for me". Beside the lead single, "Shame", the album also features a new track called "Heart and I" co-written with Barlow. The track listing and cover art of the album were revealed on 13 July 2010 on Williams' official website. The image for the cover was captured by photographer Julian Broad, who also worked with Williams for the Reality Killed the Video Star album cover. The cover was shot in May 2010 in Malibu, California. Williams and Barlow performed "Shame" on 12 September 2010 at the Help for Heroes held at the Twickenham Stadium. They also performed the single on Strictly Come Dancing on 2 October 2010. On 8 October 2010 they gave an interview and performed on Paul O'Grady Live. On 7 October 2010 Barlow and Williams performed "Shame" and "Shine" on the BBC Radio 1 Live Lounge. On the release date of the album in the UK, Williams gave an interview on Daybreak as well as performing "Feel" and "Shame". The only single to be released is "Shame", a duet co-written with fellow Take That member Gary Barlow. The video and the song premiered on 26 August 2010. Directed by Vaughan Arnell, the video is a spoof of the film Brokeback Mountain. Tim Jonze from The Guardian has said that the song is "a gentle country ballad that tells the story of the pair patching up the relationship that was damaged after Williams left Take That in 1995." It debuted at number two on the UK Singles Chart, making the song Williams' 28th top ten entry on the chart. "Shame" has also charted within the top 10 and top 20 in Denmark, Italy, Germany, Belgium, Ireland and the Netherlands. Yahoo! Music has ranked the video for "Shame" as the 14th best video of 2010. The compilation does not include "United", a single released by Williams in 2000 as part of Pepsi's "Ask for More" advertising campaign, and three singles only released in certain territories: "Win Some Lose Some", "Better Man" and "Bongo Bong and Je Ne T'aime Plus". John Bush from AllMusic gave the album four stars out of five. He said that even in its most basic edition, the album presents "no less than 39 examples of what made Robbie Williams a fascinating millennial superstar". He described Williams as "ambitious and self-deprecating, sensitive and boorish, dynamic and introverted" and that the album "presents a much richer picture of Williams' discography". Bush concluded his review by saying that "In and Out of Consciousness certainly offers a full portrait of Robbie Williams, the greatest pop star of the '90s and 2000s that few people appeared to respect but everyone enjoyed." Sean Egan from BBC Music said that "Many of the songs are amongst the strongest chart hits of the new millennium, especially Williams’ collaborations with Guy Chambers". Egan said that "The sequencing is bizarre but has its own kind of logic, working backwards chronologically" and as "the familiar tunes go by, one is struck by the fact that Williams is both underrated [...] and overrated." He also stated that had Williams "not been sacked by Take That, he would never have been motivated to prove himself with edgy, knowing music light years beyond the boyband." Egan concluded his review by saying that "If this compilation is closing a chapter, the jury is still out on whether the next one is going to be a gripper." In and Out of Consciousness: Greatest Hits 1990–2010 is available in several formats: a two CD standard edition, a three CD deluxe edition with rarities and B-sides, a DVD edition which includes the music videos of the standard edition and an "ultimate edition" which includes all three CDs, the two DVDs and a bonus third DVD with a live recording of Williams' concert at the Velodrom, Berlin in 2005. 3. "A Place to Crash"
5. "The Trouble With Me"
Credits for In and Out of Consciousness: Greatest Hits 1990–2010 adapted from Allmusic. ^ a b c d "In And Out Of Consciousness: Robbie's Greatest Hits 1990–2010 Is Coming!". RobbieWilliams.com. Retrieved 23 June 2010. ^ "In and Out of Consciousness: The Greatest Hits 1990 – 2010". Billboard.com. Retrieved 23 June 2010. ^ "Robbie's Greatest Hits a Hit at Number One". Theofficialcharts.com. Retrieved 18 October 2010. ^ a b "Certified Awards Search". British Phonographic Industry. 15 October 2010. Archived from the original on 17 January 2010. Retrieved 16 October 2010. ^ "Music Week – Music Week – Music business magazine – Cee-Lo and Robbie set to top charts". Music Week. 12 October 2010. Retrieved 16 October 2010. ^ "Robbie Williams Scores Ninth U.K. No. 1 Album". Billboard.biz. 30 May 2006. Retrieved 18 October 2010. ^ Sexton, Paul (21 October 2010). "Robbie Williams' Hits Set Debuts Atop Euro Chart". Billboard. Billboard.biz. Retrieved 22 October 2010. ^ Rosie Swash (7 June 2010). "Robbie Williams and Gary Barlow reunite on record". Guardian. Retrieved 23 June 2010. ^ a b c d e "In And Out Of Consciousness: The Greatest Hits 1990-2010". RobbieWilliams.com. 10 October 2010. Retrieved 20 June 2016. ^ "Heroes Concert: Photo Gallery". RobbieWilliams.com. Retrieved 24 September 2010. ^ "Robbie And Gary To Perform On Strictly Come Dancing". RobbieWilliams.com. Retrieved 18 October 2010. ^ "Robbie And Gary To Appear On Paul O'Grady Live". RobbieWilliams.com. Retrieved 11 October 2010. ^ "Radio 1 – Live Lounge – Robbie and Gary". BBC. 7 October 2010. Retrieved 11 October 2010. ^ "Robbie To Perform On Daybreak". RobbieWilliams.com. Retrieved 11 October 2010. ^ "Shame: Video Premiere". RobbieWilliams.com. 9 October 2005. Retrieved 28 August 2010. ^ Cragg, Michael (26 August 2010). "New music: Robbie Williams feat Gary Barlow – Shame | Music | guardian.co.uk". London: Guardian. Retrieved 28 August 2010. ^ Tim Jonze (26 August 2010). "Robbie Williams's Take That return may be temporary, says Gary Barlow | Music". London: The Guardian. Retrieved 28 August 2010. ^ "Archive Chart". Theofficialcharts.com. Retrieved 11 October 2010. ^ "Tinie Tempah Makes Big Debut On UK Chart". Billboard.biz. Retrieved 12 October 2010. ^ "Robbie Williams and Gary Barlow – Shame – Music Charts". Acharts.us. Retrieved 12 December 2010. ^ "The Most Awesome Music Videos Of 2010 – Video Ga Ga". New.music.yahoo.com. 20 December 2010. Retrieved 27 December 2010. ^ a b Bush, John (11 October 2010). "In and Out of Consciousness: Greatest Hits 1990–2010 – Robbie Williams". AllMusic. Retrieved 18 October 2010. ^ a b "Music – Review of Robbie Williams – In and Out of Consciousness: Greatest Hits 1990–2010". BBC. Retrieved 18 October 2010. ^ Shriver, Jerry (13 September 2010). "Listen Up: Weekend Plugs". Usatoday.Com. Retrieved 15 November 2010. ^ "Robbie Williams – 'In And Out Of Consciousness' – Album Reviews". New.uk.music.yahoo.com. 14 October 2010. Retrieved 18 October 2010. ^ a b c d "New Editions Of In And Out Of Consciousness Available". RobbieWilliams.com. 9 October 2005. Retrieved 19 August 2010. ^ "The Greatest Hits 1990–2010 In And Out Of Consciousness (3CD Deluxe Edition) – CDs at Play.com (UK)". Play.com (UK). Retrieved 18 August 2010. ^ a b "In And Out Of Consciousness: Greatest Hits 1990 – 2010: Robbie Williams: Music". Amazon.com. Retrieved 24 September 2010. ^ "In & Out Of Consciousness: Greatest Hits 1990 – 2010 – Robbie Williams". AllMusic. Retrieved 27 December 2010. ^ "australian-charts.com – Robbie Williams – In And Out Of Consciousness – The Greatest Hits 1990–2010". ARIA Charts. Hung Medien. Retrieved 21 October 2010. ^ "Robbie Williams – In And Out Of Consciousness – The Greatest Hits 1990–2010 – austriancharts.at". Ö3 Austria Top 40 (in German). Hung Medien. Retrieved 21 October 2010. ^ "ultratop.be – Robbie Williams – In And Out Of Consciousness – The Greatest Hits 1990–2010". Ultratop (in Dutch). ULTRATOP & Hung Medien / hitparade.ch. Retrieved 16 October 2010. ^ "ultratop.be – Robbie Williams – In And Out Of Consciousness – The Greatest Hits 1990–2010". Ultratop (in French). ULTRATOP & Hung Medien / hitparade.ch. Retrieved 16 October 2010. ^ "Top of the Shops – službena tjedna lista prodanih albuma u Hrvatskoj". Hdu-toplista.com. 22 October 2010. Retrieved 26 October 2010. ^ "ČNS IFPI". Hitparáda – TOP50 Prodejní (in Czech). IFPI Czech Republic. Retrieved 21 October 2010. ^ "danishcharts.com – Robbie Williams – In And Out Of Consciousness – The Greatest Hits 1990–2010". IFPI. Hung Medien. Retrieved 22 October 2010. ^ "dutchcharts.nl – Robbie Williams – In And Out Of Consciousness – The Greatest Hits 1990–2010". MegaCharts (in Dutch). Hung Medien / hitparade.ch. Retrieved 16 October 2010. ^ "Robbie Williams' Hits Set Debuts Atop Euro Chart". Billboard.biz. 30 May 2006. Retrieved 22 October 2010. ^ "Finnish charts portal". finnishcharts.com. Retrieved 26 October 2010. ^ "Musicline.de – Chartverfolgung – Williams,Robbie – In And Out Of Consciousness". Media Control Charts (in German). PhonoNet GmbH. Retrieved 22 October 2010. ^ Hung Medien. "Greek charts portal". greekcharts.com. Retrieved 4 November 2010. ^ "MAHASZ – Magyar Hanglemezkiadók Szövetsége". mahasz.hu. Retrieved 11 November 2010. ^ "FIMI – Federazione Industria Musicale Italiana – Classifiche". Fimi.it. 17 October 2010. Archived from the original on 2 November 2013. Retrieved 22 October 2010. ^ "Chart Track". Irish Albums Chart. GfK. Retrieved 16 October 2010. ^ Hung Medien. "mexicancharts.com – Mexican Charts – Albums – 42.42.2010". Mexican Charts. Retrieved 26 October 2010. ^ "charts.org.nz – Robbie Williams – In And Out Of Consciousness – The Greatest Hits 1990–2010". RIANZ. Hung Medien. Retrieved 21 October 2010. ^ Steffen Hung. "Norwegian charts portal". norwegiancharts.com. Retrieved 4 November 2010. ^ "Oficjalna lista sprzedaży :: OLiS – Official Retail Sales Chart". OLiS. 24 October 2010. Retrieved 4 November 2010. ^ Hung Medien. "portuguesecharts.com – Portuguese Charts – Albums – 43.43.2010". Portuguese Charts. Retrieved 26 October 2010. ^ "Archive Chart". Scottish Albums Chart. The Official Charts Company. Retrieved 21 October 2010. ^ Hung Medien (17 October 2010). "Spanish charts portal". spanishcharts.com. Retrieved 26 October 2010. ^ Hung Medien. "swedishcharts.com – Swedish Charts – Albums Top 60 2010-10-22". Swedish Charts. Retrieved 22 October 2010. ^ "Robbie Williams – In And Out Of Consciousness – The Greatest Hits 1990–2010 – hitparade.ch". Swiss Music Charts (in German). Hung Medien. Retrieved 21 October 2010. ^ "Archive Chart". UK Albums Chart. The Official Charts Company. Archived from the original on 15 June 2011. Retrieved 17 October 2010. ^ "Ultratop Belgian Charts". ultratop.be. Retrieved 14 January 2011. ^ "Album 2010 Top-100". Danish Albums Chart (in Danish). Nielsen Music Control. 2010. Archived from the original on 29 January 2011. ^ Steffen Hung. "Dutch charts portal". dutchcharts.nl. Retrieved 14 January 2011. ^ "2010 European Top 100 Albums". Billboard. ^ "VIVA Album Jahrescharts 2010". VIVA. Archived from the original on 10 January 2011. Retrieved 14 January 2011. ^ "UK 2010 Year End Album Chart". BBC. Retrieved 14 March 2011. ^ "ARIA Charts - Accreditations - 2011 Albums". ARIA Charts. 28 February 2011. Retrieved 24 March 2011. ^ "IFPI Austria – Gold & Platin". International Federation of the Phonographic Industry. IFPI.at. 11 October 2010. Archived from the original on 1 February 2010. Retrieved 3 December 2010. ^ "Hitlisten.NU". Hitlisterne.dk. Retrieved 14 January 2011. ^ "IFPI Platinum Europe Awards – Q4 2010". Ifpi.org. 1 September 2005. Retrieved 24 March 2011. ^ "Disque en France". Disque en France. Archived from the original on 24 December 2010. Retrieved 3 March 2011. ^ "The Irish Charts – 2010 Certification Awards – Gold". IRMA. Retrieved 23 July 2011. ^ "GfK Retail & Technology: ARTISTI - Dalla settimana 1 del 2009 alla settimana 11 del 2011" (PDF). Federazione Industria Musicale Italiana. Archived from the original (PDF) on 29 April 2012. ^ "Certified Awards Search". International Federation of the Phonographic Industry. 28 November 2010. Archived from the original on 15 July 2010. Retrieved 29 November 2010. ^ a b c "In & Out of Consciousness: Robbie Williams: Amazon.de: Musik". Amazon.de. 9 September 2009. Retrieved 1 July 2010. ^ "Buy In And Out Of Consciousness; Greatest Hits 1990 – 2010 Robbie Williams, Rock & Pop, CD". Sanity. Retrieved 28 August 2010. ^ "The Greatest Hits 1990–2010 In And Out Of Consciousness: Robbie Williams: Amazon.co.uk: Music". Amazon.co.uk. Retrieved 23 June 2010. ^ "In And Out Of Consciousness : Greatest Hits 1990–2010: Robbie Williams: Amazon.fr: Musique". Amazon.fr. 13 September 2010. Retrieved 24 September 2010. ^ "IN AND OUT OF CONSCIOUSNESS: GREATEST HITS 1990–2010 (3 CD'S) (DLX)". mixup.com. Retrieved 7 October 2010. 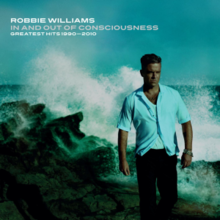 ^ "Amazon.com: In & Out of Consciousness: Greatest Hits: Robbie Williams: Music". Amazon.com. Retrieved 7 October 2010. ^ "In and Out of Consciousness: Greatest Hits 1990–2010: Robbie Williams: Amazon.ca: Music". Amazon.ca. Retrieved 7 October 2010. ^ "The Greatest Hits 1990–2010 In And Out Of Consciousness: Robbie Williams (Brazil release date)". livrariacultura.com.br. Retrieved 6 October 2010.